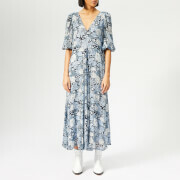 Women’s ‘Dainty’ mini dress from Scandinavian brand, Ganni. Cut from sheer, weightless Georgette, the black dress features a round neckline, ¾ length bell sleeves and a flared hem. Fastening with a concealed zip to the nape, the dress is completed with a colourful floral pattern. Lined.